Tasteful, private accommodation set in five acres of sunny farmland overlooking the picturesque Mansell Valley with ponds, vineyards, and a variety of wildlife. Central location, five minutes from Ganges yet situated in open countryside with forest and field trails directly from property. Completely self contained and private, the cottage is not overlooked by any other property. Tranquility Cottage sleeps two to four: bedroom with queen-size bed and hide-a-bed in the lounge. Large, covered deck with Japanese garden and barbecue. Private hot tub for your complete relaxation. Outdoor fire pit (subject to island burning restrictions in the dry season). DVD with a selection of movies and a CD player. Telephone. Fully-equipped kitchen including dishwasher. Bathroom with bath and shower. Washer/dryer. Welcome basket. Baby-sitting service available. Having had many cottage holidays, the proprietors have learned from experience what works and what doesn't. 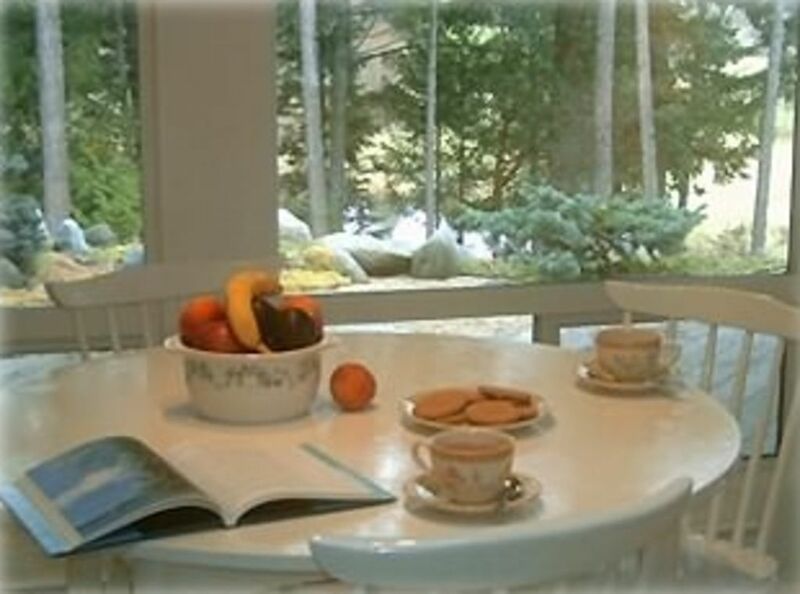 They have endeavoured to provide their ideal vacation rental and, judging from the comments in the Visitors' Book, they have certainly succeeded. This property is well situated, being just 5 mins from the markets and shopping center in Ganges yet sited within beautiful, rolling, peaceful countryside. The best of both worlds! An 'away from it all' experience in the heart of the country. Peaceful, tranquil and private. The long grasses and wildflowers, rarely seen in the city, are in abundance here along with nesting birds, owls, rabbits, deers, frogs, etc. Spacious bathroom with tub and shower. You are never far away from the ocean on Salt Spring Island! Located in the beautiful Mansell Valley with rolling meadows and a vineyard. Very scenic and peaceful. Just 5 minutes by car to Ganges village or take a pleasant, 30 minute stroll. A land line telephone is available in our on-site office. Excellent communication, cottage is very clean, really good location that is within 5-7 minute driving distance to the ferry terminal (Long Harbour) and the Ganges. Despite the rainy weather, we had a really good time. Delicious bread and eggs left on the table as a welcome gift ! Thank you very much ! Thank you for sharing your lovely cottage. We enjoyed the peace and quiet of your property, the chickens and Lucy the sheep wandering around and the sun peaking through the trees. The breakfast supplies - especially the fresh eggs, were a wonderful addition. We would be happy to stay here again! Good base for exploring the island. All you need is waiting for you. We enjoyed our stay, The cottage was comfortable and met all our expectations. Quiet, clean and comfortable. A 4.5 star rating! Private and comfortable. 6 minute drive from town, and super private place with hot tub. Bed is a little firm, could use a foam pad. Kitchen well stocked with seasoning. Nice basket to greet us with eggs, bananas, bagels, and juice. Would highly recommend staying here/would stay here again. Tranquility Studios - two on-site studios ; Original watercolor paintings/prints and greeting cards and an Interactive model railroad show. There is also a small hobby farm with pet sheep, goat and chickens. Extra Persons The fees quoted are for single or double occupancy. Extra persons are charged $30/night for the first 1 or 2 nights; subsequent nights are FREE. Minimum Nights Policy We have a 2-night minimum booking policy all year except in the months of July and August when there is a 3-night minimum. Cancellation Policy Deposit will be refunded if cancellation is more than 30 days prior to arrival. All funds are non-refundable if the cancellation is less than 30 days prior to arrival. All cancellations will incur a $30 admin fee.